MOFFETT FIELD, CA, April 8, 2019 (Made In Space PR) — Made In Space, Inc. (MIS) announced today that it is developing an in-space manufacturing system to enable precision long-baseline interferometry missions. 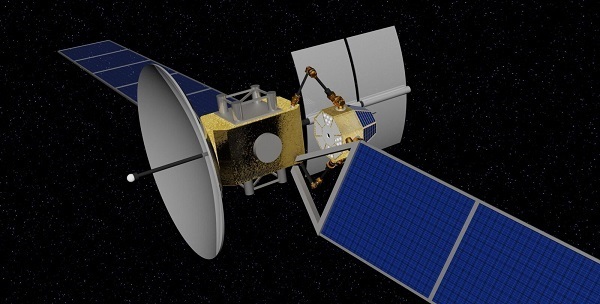 This technology, known as Optimast-SCI (Structurally Connected Interferometer) equips an ESPA-class small satellite with the company’s extended structure manufacturing technology. 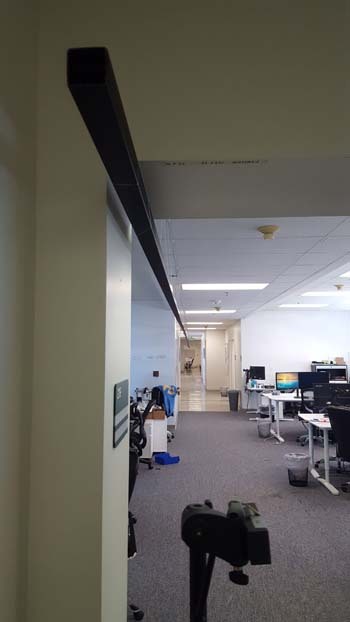 It enables the deployment of a 20-meter optical boom interferometer with modular internal optics bench developed with Lowell Observatory, a world leader in astronomical optical interferometry. BREMEN, Germany, October 2, 2018 (NanoRacks PR) — In August 2018, NanoRacks was one of 13 companies selected by NASA to study the future of commercial human spaceflight in low-Earth orbit, including long-range opportunities for the International Space Station. Today, NanoRacks is pleased to share the expansive industry team that the Company will be working with to complete this study and show the viability of commercial habitats (“Outposts”) in low-Earth orbit and the future of International Space Station commercial utilization. 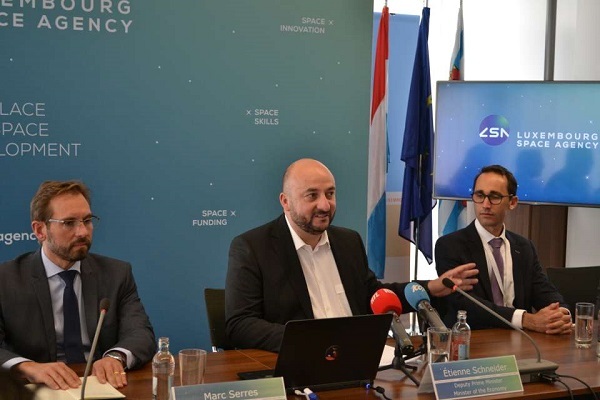 LUXEMBOURG CITY (Luxembourg Space Agency PR) — The arrival of Made In Space, Hydrosat and CubeRover further widens the spectrum of activates of the Luxembourg business-oriented space ecosystem and reinforces the Luxembourg space capabilities. VIENNA, Va., August 23, 2018 (Space Adventures PR) — NASA recently announced that Space Adventures, the only company to have delivered private human spaceflight missions to the International Space Station (ISS), was one of 13 companies selected to study the future of commercial human spaceflight in low-Earth orbit (LEO). The purpose of the study is to inform NASA’s strategy for enabling the commercialization of human spaceflight in LEO and NASA’s long-term requirements for the ISS. In December, Space Adventures will submit recommendations to NASA on how to quantify the LEO market opportunity, evaluate technical concepts for low-cost habitation, and describe a viable and sustainable business case in LEO. NASA has selected three proposals focused on the utilization of the International Space Station (ISS) under its Small Business Innovation Research (SBIR) Phase 1 program. NanoSonic wants to demonstrate the production of photovoltaic cells and arrays aboard the station. Made in Space’s proposal is focused on production of glass alloys in microgravity. IRPI wants to demonstrate a system for better handling liquids for life support and other uses. 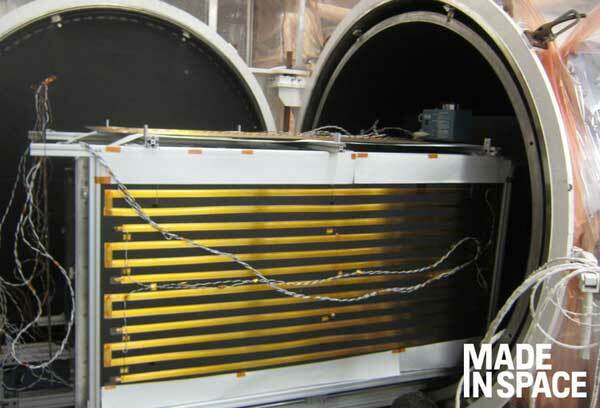 Made in Space (MIS) will develop systems for the production of glass alloys in microgravity, the assembly and refurbishment of modular platforms in orbit, and the in-space manufacturing of large structures for infrared space interferometry missions with the help of NASA funding. The three projects were among five Made in Space proposals that NASA selected for funding under its Small Business Innovation Research (SBIR) Phase I program. Each contract is worth up to $125,000 over 13 months. NASA has selected four advanced manufacturing projects for funding under the space agency’s Small Business Innovation Research (SBIR) Phase II program. 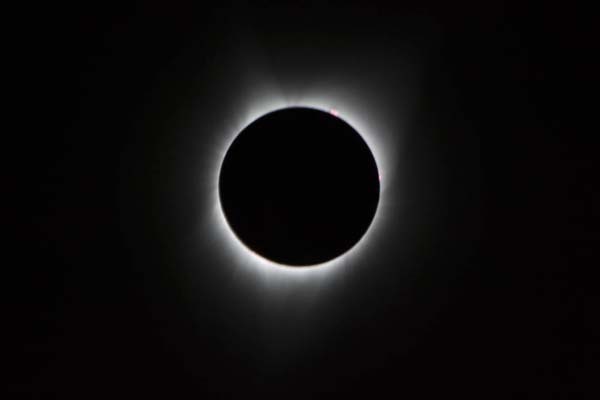 Ultratech Machinery, Made in Space, Supercool Metals and Intelligent Optical Systems were selected for two-year contracts worth up to $750,000 apiece. Each company received funding for its project under the first phase of the SBIR program. 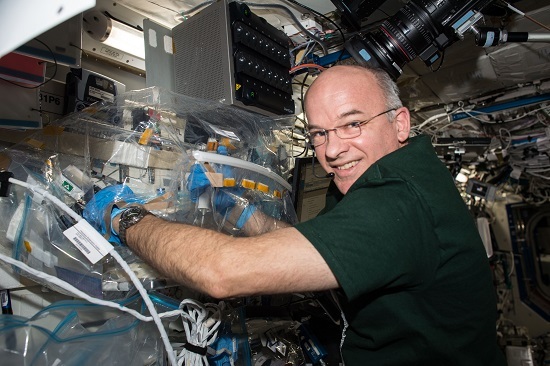 Ultratech Machinery is being funded to develop a multi-material, ultrasonic additive manufacturing (3D printing) laboratory for use aboard the International Space Station (ISS). NASA has selected two proposals from Made in Space focused on producing advanced crystals and high-strength components for funding under the space agency’s Small Business Innovation Research program. Each two-year Phase II is worth up to $750,000. The Industrial Crystallization Facility (ICF) would produce “nonlinear optical single crystals and other relatively large material formulations, such as bulk single-crystal thin films and high temperature optical fiber,” according to the proposal. 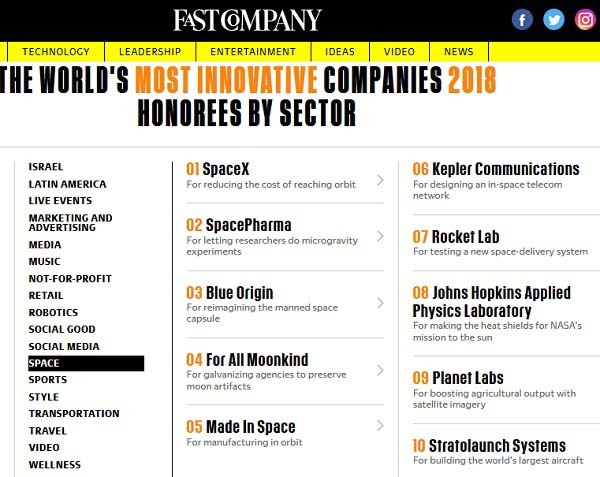 Fast Company has released its annual list of the most innovative companies for 2018. The 10 top innovators in the space industry are shown above. I’m a bit surprised by Stratolaunch landing at no. 10. The aircraft is impressive; I’ve seen it in person outside, and it’s positively Spruce Goosian in its size and ambition. And I’ve been on tarmacs walking around a 747 and an A380, which are also very large airplanes. That being said, the reality is that the only rocket it available to launch is a Pegasus, whose primary launch aircraft is Orbital ATK’s 44-year old L-1011 that’s parked just down the flight line from the Stratolaunch hangar. They’re working on developing a larger booster for the giant aircraft, so maybe Stratolaunch will be as innovative as Fast Company believes it is at some point. Never say never. It just seems that Burt Rutan got focused on building the coolest flying vehicle he could while the whole issue of the rocket was not as well thought through. A similar thing happened with SpaceShipTwo, contributing to years of delay. The other thing is I heard last fall is the Stratolaunch aircraft might not fly until sometime well into next year. So, it could be a while before we see how well that thing actually performs in flight. HOUSTON (NASA PR) — SpaceX’s Dragon cargo spacecraft splashed down in the Pacific Ocean on Saturday, Jan. 13, west of Baja California, with approximately 4,100 pounds of NASA cargo, science and technology demonstration samples from the International Space Station. The Dragon spacecraft will be taken by ship to Long Beach, California, where some cargo will be removed immediately for return to NASA. 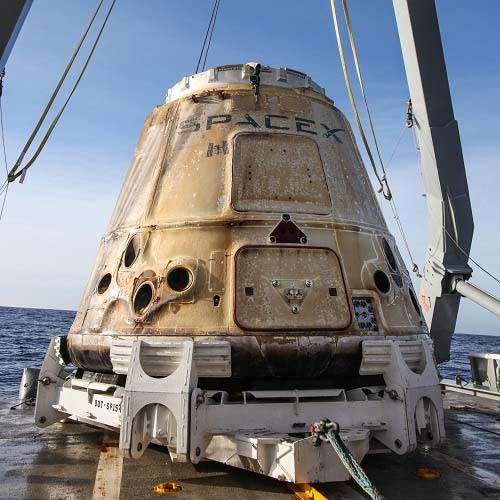 Dragon then will be prepared for a return trip to SpaceX’s test facility in McGregor, Texas, for final processing.